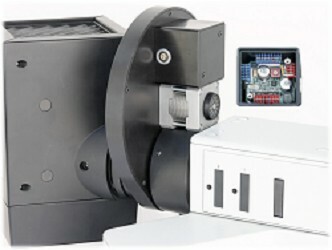 Press Release from TOFRA, Inc.
Palo Alto, CA (January 2007) – TOFRA, Inc. has released the Filter Wheel with Integrated Controller for optical microscopes. This innovative cost-saving design requires less desk space and reduces cable clutter. The filter wheel provides fast computer-controlled or manual switching of filters. It can accommodate either 12 filters, 25mm in diameter, or 10 filters, 32mm in diameter. An infra-red blocking filter can be installed on the side facing the light source. The filter wheel is used for changing filters in the excitation or emission light path of the microscope. On some microscopes it can be mounted in the transillumination light path. Mounting adapters are provided for all major microscope brands. The wheel can be mounted facing front or back. The filter wheel has a simple and very reliable construction. It is compact in size: 17mm thick with maximum dimension of the housing 180 mm. A knob with numbers corresponding to the current active filter is mounted on the front of the wheel. The Filter Wheel with Integrated Controller does not need any additional control units, which saves valuable desk space; it connects directly to the computer serial port (or to USB port through USB-to-serial converter) via a custom cable. The wheel can be used with desktop or laptop computers. The wheel can be daisy-chained with other filter wheels, focus drives, and stages, creating an automated microscope system. The cables carry only direct current and communications signals minimizing electromagnetic interference. The Filter Wheel with Integrated Controller is the first device in the new generation of microscope automation products from TOFRA that have built-in controllers. For more information check the company web site www.tofrainc.net or contact Ilya Ravkin at iravkin@tofrainc.net, by phone 650-494-7772, or write to TOFRA, Inc., 945 Colorado Ave., Palo Alto, CA 94303. TOFRA, Inc. provides microscope automation hardware and software to end users and system integrators since 1993.